"Nec tamen consumebatur (yet it is not consumed)." Scotland's ancient Celtic Christian traditions had not been lost under the consolidation of papal authority. 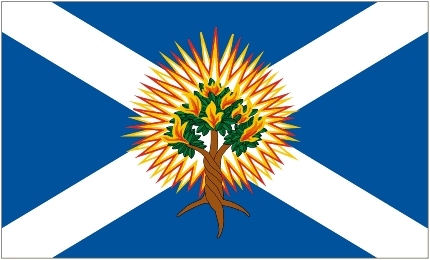 By the sixteenth century, the country was ready to break free from the influence of Rome and eagerly adopted Lutheran teachings, which had first arrived in Scotland in 1517. The call for reform dominated the first half of the sixteenth century, culminating in the Scottish Reformation of 1560, led by John Knox. 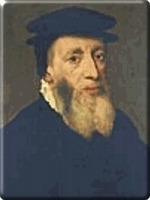 The reformed church adopted a Calvinist confession of faith based on justification by faith and a rejection of all religious works that have no Scriptural warrant, including the rites of Roman Catholicism. In 1578, Andrew Melville described a presbyterian polity in his Book of Discipline, which insisted on the equality of ministers and rejected the idea of governance by hierarchies of single bishops, or episcopal polity. The presbyterian polity, however, also rejected the congregationalist polity, which allowed for the independence of each parish. In contrast to these, the presbyterian polity is both top-down and bottom-up. Higher assemblies exercise considerable authority over individual congregations, but each official ultimately owes his election to individual parishioners. In Melville's presbyterian polity, each local church would be governed by an assembly of learned elders elected by the congregation. The local churches would in turn be overseen by a regional body, or presbytery, composed of ministers, elders, and scholars from each parish the body governed. Groups of presbyteries were further grouped into a larger synod, and synods nationwide composed a General Assembly, which would serve as the church's highest governing authority. The struggle for supremacy between the presbyterian and episcopal systems - which in turn were manifestations of the battle between church and state and of Scotland's tumultuous relationship with England - waged in Britain for more than one hundred years in a bitter conflict that would culminate in the first state execution of a monarch in European history. After the dust began to settle following the Glorious Revolution, Parliament finally established the Kirk of Scotland as the official state church on a Presbyterian basis in 1690. Not that this ended the religious conflicts: the Kirk of Scotland still resented the state's interference with its independence, especially as civil courts interfered with the decisions of ecclesiastical courts pertaining to the right of patronage. The right of a wealthy patron to install a personally-selected minister into a parish became a point of contention between those who saw this as an infringement on the spiritual independence of the church and those who regarded it as a matter of property under the state's jurisdiction. While the Glorious Revolution had ended the right of patronage, the state restored it in 1712, in spite of Kirk remonstrance, to allow nobles to regain the control over their parishes. The Kirk resented this aristocratic intrusion into church elections, which it considered lay investiture, but despite the attempts of the General Assembly to redress this grievance, the strength of the aristocracy, the voice of the moderate party within church government, blocked any confrontation with the government. 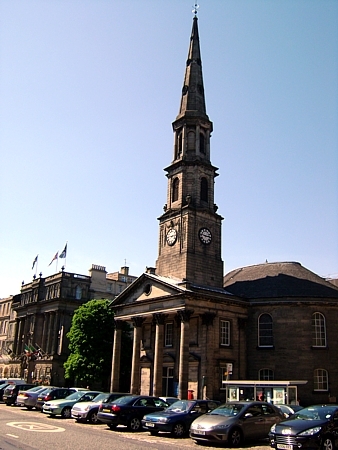 The first groups of dissenters began to break away from the established Kirk in 1733, leading to a century of denominational schisms that culminated in the Disruption of 1843. The direct path to this great schism began in 1834 when the Evangelical party attained a majority in the General Assembly for the first time in a century. One of its first actions was to pass the Veto Act, which gave parishioners the right to reject the installation of a minister nominated by their patron. Its effect, however, was to polarize church politics and set it on a collision course with the government. When the parish of Auchterarder in Perth and Kinross unanimously rejected their patron's nominee and refused his ordination and induction, the rejected individual appealed to the Court of Session, Scotland's supreme civil court. In 1838, the Court ruled in an 8-5 majority that in passing the Veto Act the Kirk had infringed upon the statutory rights of patrons. The Court went on to state that the established Kirk was a creation of the state and derived its legitimacy by Act of Parliament. The latter part of this ruling was a direct contradiction of the Kirk's confession of faith and undercut its own principles of self-understanding. This ruling effectively repudiated the notion of the Kirk as an independently-governed community, and transformed the issue of patronage into one of spiritual independence. There were many other similar cases to exacerbate this issue. In response, the General Assembly recognized before Parliament that the civil courts had jurisdiction over endowments given by the state to the established Kirk. In order to maintain the Kirk's sovereignty, however, the Assembly resolved to give up these privileges, which had compromised its integrity. Parliament rejected this request in January 1843. 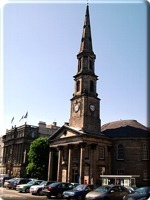 In May, five hundred ministers exited the Kirk of Scotland General Assembly at the Church of St. Andrew on George Street, Edinburgh to form the Free Kirk of Scotland. Christ, not Parliament or the monarch, was their head. With great zeal, sacrifice, and determination, the new church set itself with the enormous task of establishing a presence in every parish in the country - in essence founding a national church from scratch. By 1847, the Free Kirk had built seven hundred churches and an equal number of schools, financed largely by the wealth of the emerging middle class. By pooling donations and resources from every congregation, the Free Kirk was able to provide equal incomes for over 1,200 ministers by 1900. This innovative practice of sharing and centralizing resources, previously unknown in Scotland, later became the norm. In 1921, Parliament finally passed the Church of Scotland Act, recognizing the full independence of the Church in spiritual matters (the Patronage Act had been repealed in 1874), allowing it to be a national rather than a state church. (In a state church such as the Church of England, for example, the British monarch is its Supreme Governor, whereas the monarch is simply a member of the congregation of the Kirk of Scotland.) Eight years later, the Kirk and the United Free Kirk of Scotland (the product of a 1900 union between the Free Kirk of Scotland and the United Presbyterian Church of Scotland) reunited. However, some independent Presbyterian denominations still remained outside of the established Kirk, which never fully recovered its status.